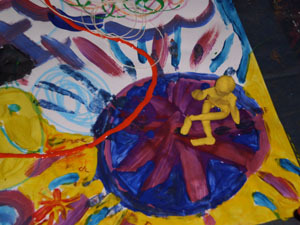 The medium of art and play therapy offer opportunities to ‘meet’ the child in an accessible and non- threatening way. This may include working with paint, clay, playdoh, story making, puppets, figures and sandtray, depending on what the child is drawn to. This offers a playful and direct approach to unravelling complicated feelings which can feel beyond words and reasoning. Whether setting a family dynamic out in the sandtray, or exploring a dilemma using paint and collage, expressive arts can make the complex and difficult experience of adolescence more easily shown, and understood. Experience has shown that being able to access feelings in a direct and creative way, can enhance the therapeutic experience for the young person. Working with creative technique in adult counselling does not require a pre-existing ‘artistic skill’, neither is it a preferred choice for everyone. 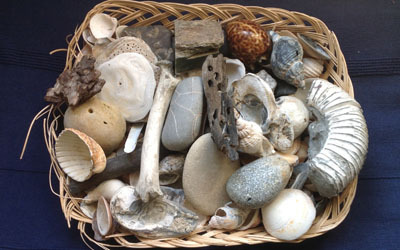 Working symbolically with image or metaphor , using artistic materials, sandtray, or dramatic technique, lends insight as well enlivening the exploratory process in a way that is fun and unthreatening. Use of the ‘third eye’ through using creative technique such as sandtray, small world or psychodramatic technique can be useful in setting out an organisational or systemic dilemma. 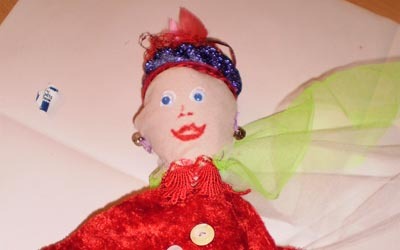 Training on the use of creative technique, such as sandtray, use of stories, art and image making, and working with clay, is available for both individuals and groups. Training can be tailored to particular interest or requirements.